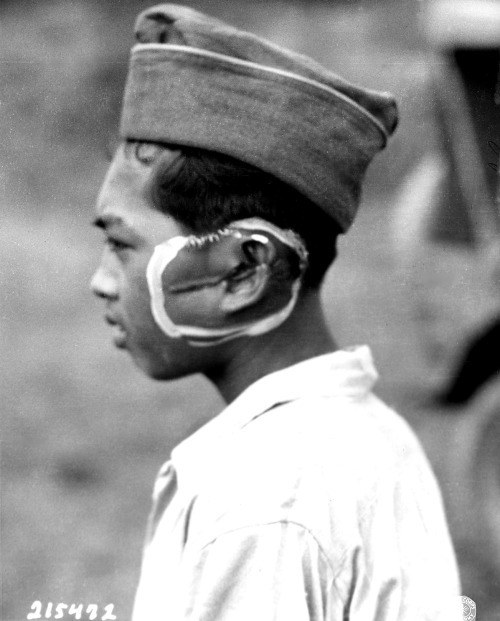 A young Filipino boy, Juan Castillo, waits at an American field hospital for treatment of a severe slash wound to the side of his head inflicted on him by a Japanese soldier. Lipa, Batangas, Luzon, Philippines. 29 May 1945. While the Battle of Manila raged on from February 03 to March 03 1945, Japanese troops in Lipa, Batangas turned their ire on hapless civilians. 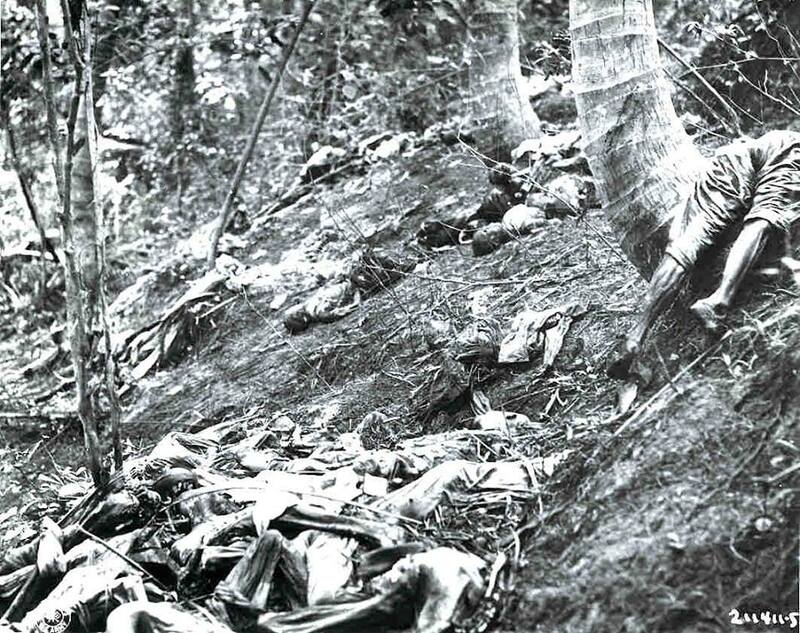 In the pretense that they were looking for guerrillas, Japanese soldiers, with the aid of Filipino collaborators would raid villages and arrest civilians who had ties to the guerrilla organization. Many were arrested for perceived insults to the Japanese troops or loyalty to America. Massacres in Lipa soon became widespread. The worst thing about the massacres was that the Japanese were aided by Filipinos who belonged to the Makapili organization. Not only did they point out to the Japanese the whereabouts of the family of the suspected guerrillas, they actually took part in the killing. February 6, 1945, Teodoro Barrameda a member of the GANAP party and a MAKAPILI accompanied by Servando Darin, Lucio Darin and Alberto Darin appeared at the house of Pablo Mendoza in the barrio of Adya, Lipa, Batangas, where they found Pedro Mendoza, his mother, and Margarito Umali. Because the mother refused or failed to tell the defendant about the whereabouts of her son Pablo, who was suspected as a guerrilla, Barrameda tied her hands, took her inside the house and set it on fire, and the house burned down completely, presumably with the mother perishing in it . Not content with this atrocity the appellant tied the hands of the son Pedro Mendoza and one Margarito Umali, who were both blinded by severe blows to the face, led them to the orchard and there bayoneted them to death. This was testified to by Pablo Mendoza and Fermin Mendoza, brothers of Pedro, sons of the woman who was presumably burned inside her house. Teodoro Barrameda was sentenced to death. February 11, 1945, Macario Bautro who is a Makapili, Led a company composed of armed Japanese soldiers and Makapilis in a raid at Barrio Marawoy, Municipality of Lipa, Province of Batangas. Macario, wearing a Japanese uniform, participated in the apprehension and arrest of about two hundred men and women. The victims hands were tied and were brought to the Citrus Station’s Office by Bautro and his companions and were later killed. The bodies were thrown into an excavation pit. After the war, Macario was arrested and sentenced to reclusion perpetua. A book, The Remains of War by Jintaro Ishida tells about the horrors of the Massacres in Lipa, Batangas. The Civilian casualties of War. Municipality of Lipa, Province of Batangas. The Sinking of the SS Corregidor Dec. 17 1941. 900-1,200 Lives Were Lost.